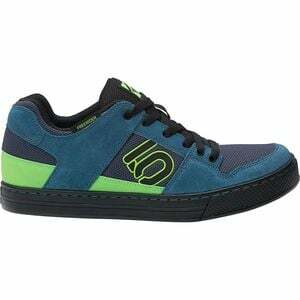 Known for its rock climbing shoes, Five Ten made the Freerider Shoes with the same grippy tech to create a shoe that is ideal for platform pedals. Stealth Rubber is not only grippy, it is also durable, designed to withstand the demands of long hours adhering to granite rock. This means that it wonâ€™t blink at the prodding of your metal pedal spikes, and it will outlast even the most expensive gum rubber soled shoes. The uppers are constructed of brushed nubuck leather and breathable mesh to keep your feet cool.